Rookie writers have asked me about the best books, classes, and seminars they can use to turn themselves into better writers. While I have a shelf full of books (soon to include my own current work in progress) and have attended numerous classes and seminars, I can attest that the one class that shaped my approach to writing was a class that had little to do with putting pen to paper or fingers to keyboard. The most important class a writer can take isn't a writing class at all. My argument is that, if you want to be a writer, you have to create characters than engage an audience. If you're going to be a screenwriter or a playwright, you have to create characters that actors can use to deliver performances that resonate with an audience. While I'm far from the first writing blogger to push writers into taking acting classes, I've always maintained that plot, structure, theme, and message should be used as tools to deliver stories about characters. The VOTE Method I teach is adapted from an acting class I took in college, and I've used it ever since to help me be a better writer. The biggest mistake most rookie writers make is that they view their stories the other way around. Characters are not mouthpieces. Actors are not meat puppets. Writers should not use them to deliver their sermons on the human condition. When a rookie writer takes this approach, the readers, the actors, and the audience will see through the writer's sanctimony and self-satisfaction. The best way to avoid this “writer-first” mentality is for writers to put themselves in the actor's shoes. Scene work can also help writers understand the importance of every character in their work. Many rookie writers view the secondary characters as tools to serve their main character's story. When a you work through a scene playing a secondary character, you'll understand that failing to give these characters adequate substance gives the actor too little to do, which leads to a poor or disengaged performance. Whey you attempt to learn dialogue in an acting class, you can tell when the lines serve either or both of these purposes or when it sounds stiff or unnatural. In real life, most of us try to avoid conflict. In writing, you should seek it out. When you take an acting class, you can see the power that conflict between characters has on creating a memorable scene. When you take part in a scene as an actor, you can feel what that character feels, what fuels their desires, what stands in their way, ans what they'll do to get what they want, all of which will make you a better writer. A core requirement of your job as a writer is to deliver characters that will keep an audience riveted to the page, the stage, or the screen. The writing process is all about inhabiting those characters' lives, feeling their experiences, and bringing them to life. In all of these senses, the writer must serve as an actor for every single character. When a writer understand the process by which an actor inhabits a character, the writer can apply that process into their own methods. From there, character arcs become tools by which the writer delivers a strong character for the actor to portray and a powerful experience for the audience to follow. 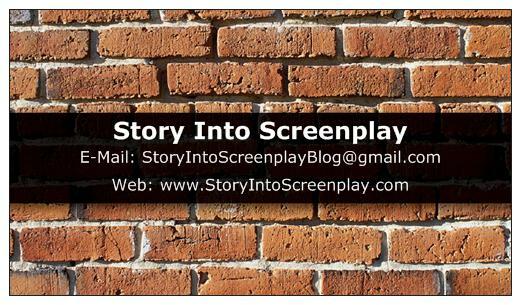 If you have a script and you would like a professional-style coverage report, let Story Into Screenplay help. A former screenplay contest judge will evaluate your script and write up a report that will evaluate factors such as character, plot, action, dialogue, and much more. 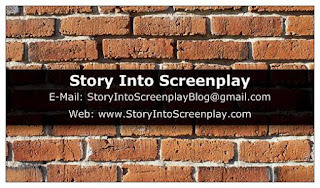 For a sample report and a rate sheet, email storyintoscreenplayblog[at]gmail[dot]com, or send a direct message through the SIS Facebook page.